Doucai is a variety of decorative porcelain formed by the combination of underglaze blue-and-white and overglaze decoration. Before firing, the contour of the pattern should be sketched on the base with blue-and-white, and some part should be filled with blue-and-white too. Then the painted base should be sent into the kiln and fired into blue-and-white porcelain, on which the blank of the previously-sketched pattern should be filled with paints of various colors. And then it should be fired again in the low-temperature kiln with oxiding flame about 800 degrees Celsius. As the underglaze blue-and-white and the overglaze decoration seem to contend for beauty, it is called "Doucai" (literally, compete for color). 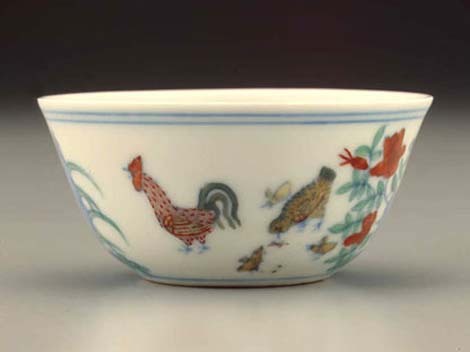 The firing of doucai porcelain dates back to the Chenghua Period of the Ming Dynasty, which is most well-known for its doucai. Chenghua doucai porcelain features quiet and elegant blue-and-white, bright and smooth white glaze, soft color, as well as white and fine base. It is a rare and fine variety of porcelain. In addition, the doucai procelain made from Kangxi to Qianlong Period is also of high artistic value.